In the spirit of the international Transgender Day of Remembrance (20th November), I’ll be looking at one of the earliest 20th century events which helped to nucleate the organisation of LGBTQ movements and rights as we know them today. The occurrence I’m referring to was the Compton’s Cafeteria Riot of 1966. A full three years before the much more famous Stonewall riots, this riot occurred in August but the exact date is lost to history. The cafeteria was located in the Tenderloin district of San Francisco, known in part as a rough patch – so unsurprisingly, had large populations of drag queens, prostitutes, and other marginalised members of society. The cafe was open 24 hours a day, which made it a popular spot for the queer underworld to frequent in the small hours. This didn’t mean the management were sympathetic to their queer customers however. The management is said to have called the police to remove a group of queens from the premises, under the pretext of noisiness, and hanging around too long without spending very much. At this time, it was extremely common practice for the police to stop people visually judged as gender variant, as it would be most likely such individuals wouldn’t match the name or appearance of any ID they might have, allowing for easy arrests. There had previously been a history of laws in the US prohibiting cross-dressing, and whilst struck down in Chicago there was still a strong association culturally with perceived cross-dressing as being associated with fraud and ‘anti-social conduct’ – so-called nuisance crimes that were often used to arrest queer people. So, the police were called, and they were used to dealing with ‘people like that’. But when trying to arrest the queens, one of them threw her cup of coffee in the officer’s face. This sparked full scale resistance – everyone started throwing everything they could get their hands on, and so the police called for backup. Chairs and tables started being thrown. The plate glass windows of the cafeteria were smashed. The fear and rage that the queer community had experienced a build-up of in response to long term, systematic abuses at the hands of the police finally overflowed. A police car was vandalised. A news stand was burned to the ground. One would think that fighting of this scale would be easy to date when it’s still within living memory. However police recording isn’t archived that far back, and more tellingly there was no newspaper coverage of the riot. One of the earliest references to the riot was 6 years later, in the program of the first San Francisco gay pride parade, in 1972. The night after the riot, the cafeteria would not allow anyone judged to be transgender (or a queen, or ‘people like that’) in to be served. This resulted in the new plate windows installed in the daytime to be smashed again. So what was the impact (beyond chairs into windows)? The queers who rose up weren’t actually completely disorganised when this riot took place. Only a couple of months earlier an organisation called Vanguard had been founded by activist ministers of Glide Memorial United Methodist Church, a very liberal church (for the time in particular) who tried to help all marginalised members of the community. Vanguard was ‘an organisation of, by, and for the kids on the streets’ – a detailed revisit of Vanguard can be found here. Vanguard’s meetings were held at Compton’s, and many of the rioters were most certainly Vanguard members. The networking and sense of urgency that the riot engendered (pardon the pun) amongst the community took activism forward. 1966 was an important year in transgender history because of the publication of the book The Transsexual Phenomenon by Harry Benjamin, which argued from a medical position that transsexuality wasn’t something that could be ‘cured’, and that doctors had a responsibility to help trans people feel happy with the gender they identified with. Such post-riot networking and in the context of this publication led to the set-up of the National Transsexual Counselling Unit by 1968, which was peer-run. 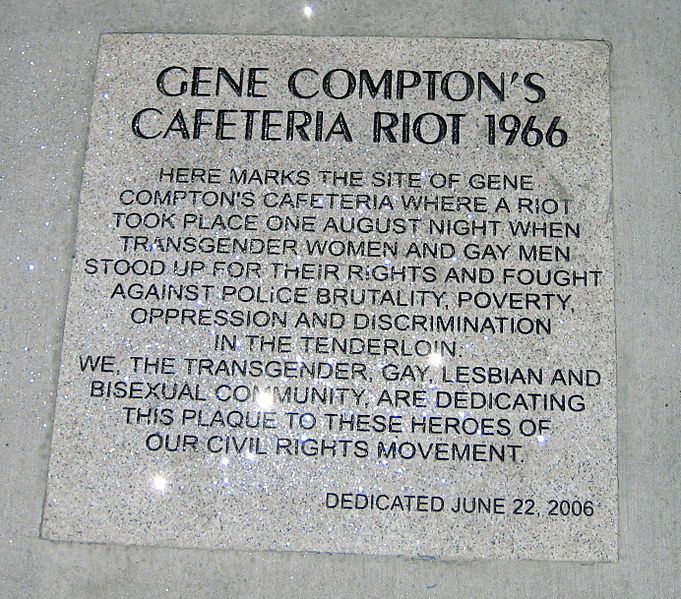 Much of the work that exists on Compton’s was put together by Susan Stryker, author of the book Transgender History (an important reference for this article) and director of the 2005 film Screaming Queens: The Riot at Compton’s Cafeteria. In these works a great deal more social and political context is provided. However it is crucial to remember the impact of past struggles for basic rights and respect, along with the victims and warriors who have fallen on the path towards transgender liberation.